Name : Eriks 10th Birthday! 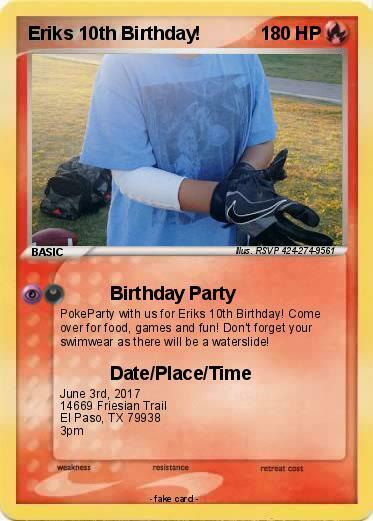 PokeParty with us for Eriks 10th Birthday! Come over for food, games and fun! Don't forget your swimwear as there will be a waterslide! King boo | Keyon's 10th Birthday | David's 10th Birthday! | Hawkdestroyer | Logachu | Linkin | TOBY GILLARD EX | Christian | Alex Campbell | Mega Diegoide EX | Clydester | Clydester | happy birthday shane | abbeys 10th birthday | Lilly | Lilly | Collin Bernardino | Peter Kim | Happy Birthday Matthew | Happy Birthday Nathan! | Birthday Raichu | Birthday Raichu | Pikachu's Birthday | Birthday Pikachu | Happy Birthday Card!!! | __________'s Birthday | Silke's Birthday | birthday Pikachu | Happy Birthday Asher | Chaos's Birthday | Birthday Pikachu | Birthday Charmander | Birthday Charmander | Birthday Raichu | Happy Birthday Edwin | Happy Birthday Peter | birthday girl | Pikachu's Birthday | Birthday Pikachu | Birthday Pikachu | Birthday | Birthday dog | Vulpix's Birthday | Birthday Puss in Boots | ____________'s rayoxys | birthday Pikachu | TrainerBenny&SudoEthan | Birthday Pikachu | The birthday bear | Happy Birthday Eddie | ________'s Pikachu | Happy Birthday Asyraf! | Nolan's Pikachu | Colinchu | Happy Birthday Fatima | Birthday Buddy | __________'s Pikachu | ____________'s Birthday | _______________'s Eevee | Happy Birthday Picachu | Birthday Pikachu | Birthday Pikachu | Birthday Pikachu | Birthday Puss in Boots | Bobby's B-Day!!!! | Happy Birthday! | Anastasia's Pikachu | birthday furbys | _________'s Pikachu | Happy Birthday!